Frontier Constabulary (FC) personnel walk past the Parliament building in Islamabad, Pakistan October 5, 2017. ISLAMABAD - An unexplained dispute between Pakistan’s interior minister and an elite paramilitary unit under his command is adding to political confusion in Islamabad, prompting questions about a rift in ties between civilian leaders and the powerful military. The spat comes at a moment of heightened concern over the feverish political climate in nuclear-armed Pakistan, which the United States seeks to include in its new strategy for South Asia. 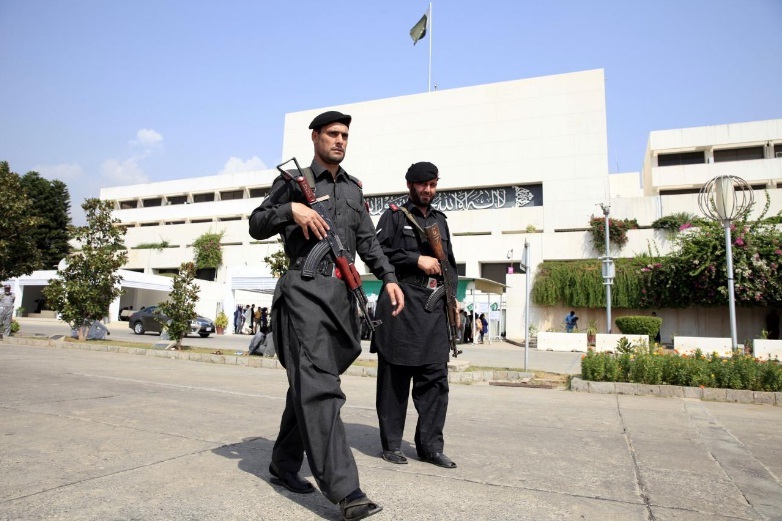 Interior Minister Ashan Iqbal was taken by surprise when the elite Rangers unit, which provides security around parliament, withdrew its guards without explanation on Wednesday. “I was told the Rangers have unilaterally withdrawn from the important installations where they were on duty, which, for us, was shocking,” Iqbal told domestic television channel Dawn News. Outside parliament on Thursday, the country’s Frontier Constabulary was on guard instead. A police official on duty confirmed the Rangers were no longer stationed there. “The order for them to leave did not come from the interior ministry, it must have come from somewhere else,” said the official, who asked not to be identified because of the sensitivity of the topic. Rangers’ officials could not immediately be reached for comment. Iqbal did not immediately respond to Reuters’ telephone calls to seek comment. The Rangers had this week denied Iqbal entry to a court building where matters relating to an anti-graft case against Sharif were being heard, prompting him to threaten to resign, saying he refused to be “a puppet interior minister”. The moves follow July’s Supreme Court disqualification of former prime minister Nawaz Sharif, which he blamed on a conspiracy against him, feeding speculation about a rupture in civilian-military ties. Senior leaders from Sharif’s Pakistan Muslim League Nawaz (PML-N) party pointed fingers at the country’s military after his disqualification for not declaring a source of income. The army denies playing a role. But the Rangers’ departure from the area around parliament points to a persistent disagreement between civilian and military leaders, one analyst said. “They can’t just leave their posts,” said Zeeshan Salahuddin, communications and strategy director of the Islamabad-based Centre for Research and Security Studies. Pakistan’s military has ruled the country for 33 of the 70 years since independence from Britain in 1947. Since 2008, there have been democratically elected governments, but the army retains sweeping influence and any hint of discord stirs worries among advocates of a strong civilian government. “We have concerns about the future of Pakistan’s government too, in terms of them – we want their government to be stable,” U.S. Secretary of State Rex Tillerson said, following a meeting with Pakistan’s foreign minister on Wednesday. The government will take action after completing an inquiry into the withdrawal, Iqbal added. “The Rangers are a force subordinate to the ministry of the interior and when they are deployed, they are supposed to work under the civil administration,” he said. An unexplained dispute between Pakistan’s interior minister and an elite paramilitary unit under his command is adding to political confusion in Islamabad, prompting questions about a rift in ties between civilian leaders and the powerful military.